While residential treatment centers can be an excellent option for some troubled teens, in many situations teen boys respond better to programs like Triangle Cross Ranch. We have put in place a program designed to help troubled boys grow as people as they develop new skills and overcome their past difficulties. This process can transform a boys life and give him the strength he needs to avoid any future problems. 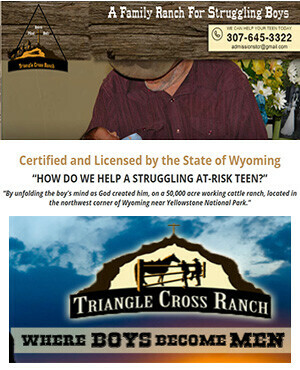 Getting your son enrolled at Triangle Cross Ranch is the best choice you can make for his future. Please contact us as soon as possible if you are in need of more information at (307) 213-7116. Is A Residential Treatment Center Right For My Teen? Many parents hesitate to seek out professional help for their teenage boys even once they start to struggle with serious problems. This is unfortunate, as it allows their problems to grow more severe and difficult to deal with. At Triangle Cross Ranch, we specialize in helping troubled teens overcome a wide variety of issues including substance abuse, anger, poor school performance, violence, rebellious behavior, and lack of motivation. Our program has been carefully designed to provide troubled boys with opportunities to fundamentally change who they are by developing as people. This approach has proven itself successful in changing the lives of hundreds of boys and helping them overcome the issues that had previously plagued their lives. We feel strongly that our program is a better option than residential treatment centers for troubled boys. If you have a son who is struggling with serious issues, it is incredibly important that you don’t just ignore the problem. When teens don’t get the support and assistance they need during these difficult times, it can prevent them from ever fully overcoming their issues. Don’t let this happen to your son. With help from Triangle Cross Ranch, your boy can put his problems in the past and become the successful individual he is capable of being. We have changed the lives of hundreds of boys in the same situation and we are confident we can make a difference for your son. Please contact us as soon as possible at (307) 213-7116.